Given the right cleaning materials (toothbrush and toothpaste) and appropriate brushing technique, it is possible to clean the teeth properly. A simple scrubbing technique will not achieve satisfactory cleaning and can cause damage to the gums and dental hard material (wedgeshaped defects). Therefore, a systematic approach to cleaning the teeth is essential. 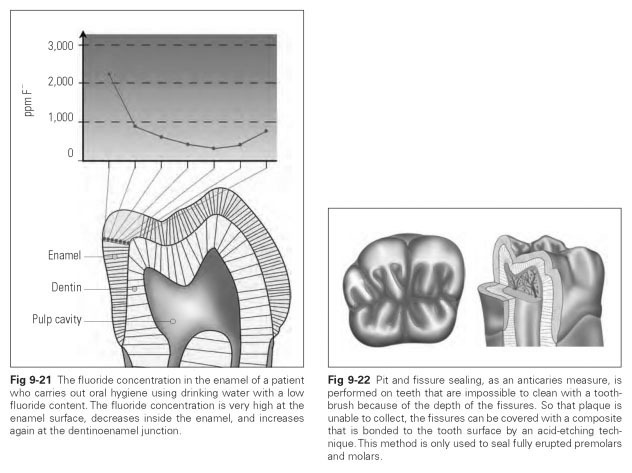 Ideally one should start by brushing the buccal surface of the distalmost tooth in the maxilla so that the fluoride-containing toothpaste is able to flow downward and rinse around the mandibular teeth. 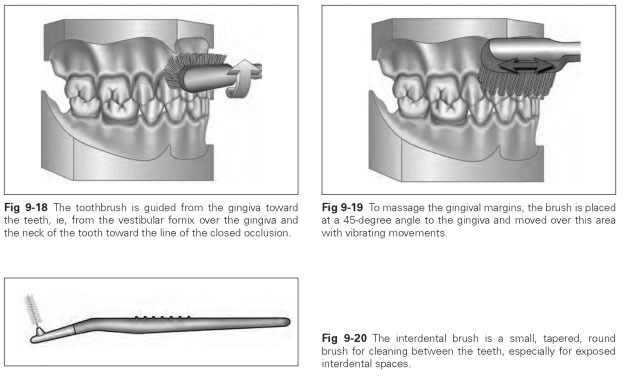 The bristles should be placed at an angle to the tooth axis, pointing toward the gum line at the junction between the tooth and the gingiva, and the brush should be moved from the gingiva to the tooth in gentle circular movements (Figs 9-18 and 9-19). Gentle pressure should be applied without bending the bristles. Cleaning is done tooth by tooth in a mesial direction over the midline of the maxilla and on to the opposite side as far as the distalmost molar. The oral surfaces of the teeth should also be cleaned with small rotating or horizontal movements. To do this, the brush head should lie parallel to the row of teeth. The toothbrush is only placed vertically in the oral area of the anterior teeth. It is impossible to reach the approximal tooth surfaces with a normal toothbrush. Various oral hygiene aids are available for cleaning the interdental spaces. Interdental brushes are small, tapered, round brushes for cleaning between the teeth (Fig 9-20). The bristles stick out at the sides. Concave interdental tooth surfaces can be cleaned with interdental brushes, which can be inserted into the interdental space from a lateral cervical position and moved back and forth several times. The brushes can be wetted with an active substance such as chlorhexidine gluconate to prevent root caries. A sulcus brush has two rows of filaments and is used to clean the gingival sulcus. Dental floss refers to synthetic threads of stretchy filaments on rolls. Dental floss is pulled through the contact points into the interdental spaces to remove any food remnants or bacterial deposits in the area of the interdental sulcus. A 30-cm-long thread should be wrapped around two fingers (eg, index fingers) and held taut. A floss tightening or holding device may also be used.The tightened thread is inserted into the approximal space with gentle sawing movements over the contact point. Deposits are removed from the surfaces with scraping movements. All the approximal surfaces of the dentition should be worked in the same way with a new section of floss. The regular topical application of low-dose fluorides has a stronger anticaries effect than irregular application of higher concentrations. Organic fluorides (eg, amine fluoride) have a greater caries-protective effect than inorganic fluorides (eg, sodium fluoride). Pit and fissure sealing is a fluoridation measure to provide a tight and lasting fissure seal that is intended to prevent fissure caries entirely (Fig 9-22). Pit and fissure sealing involves an enamel-etching technique. The fissures can be mechanically cleaned with a nonfluoride cleaning paste and chemically cleansed with sodium hypochlo-ride. The dry working area is conditioned with phosphoric acid and coated with liquid composite that is set with a halogen light. The sealing is checked by the dentist every 6 months and renewed if necessary.